Wedding Favours Australia specialises in quality and unique favours, and we are proud to be one of the few favours retailers that have a fast turnaround time in some of our personalised favours range, that is twice faster than other favours retailers. 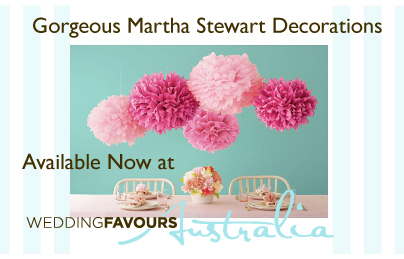 We are also excited and proud to finally have Martha Stewart Decorations range to join our quality decorations range, offering our customer more creative and inspiring ideas for their wedding or other events. Feel free to drop your comments or ideas or anything you would like us to post more about, our favours consultant will definitely help you explore the endless possibilities in making your event memorable for you and your guests. 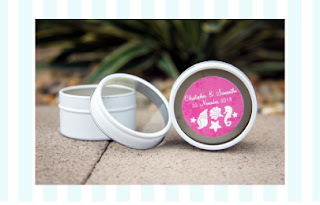 One of our personalised favours "Personalised Wedding Round Candle Tins". This would make a romantic and unique favour for a Garden Themed Wedding. 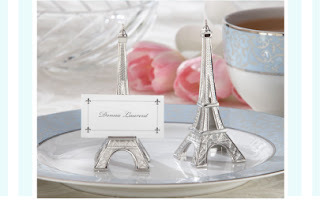 One of Kate Aspen's favour or place card holder range, this “Evening in Paris” Eiffel Tower Silver-Finish Place Card/Holder will make a perfect favour for a European or Destination Themed Wedding.